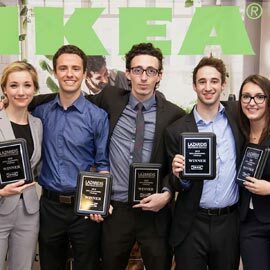 WATERLOO – An idea to recycle old IKEA furniture using 3D printers has won the IKEA Sustainability Challenge – a three-week competition held at Wilfrid Laurier University for second-year students at the Lazaridis School of Business and Economics. The challenge is sponsored by IKEA Canada to find groundbreaking ideas to integrate sustainability within the IKEA brand. The winning team hopes their idea will address the environmental issue of furniture waste. Their idea recommends a system where customers would return IKEA furniture that they no longer use to an IKEA location. IKEA would break down the furniture into a filament for 3D printers. The printers would then create new furniture, parts and products using the filament from recycled goods. The winning team, made up of Olga Dementev, Olivia Gernon, Arthur Kanishov, Krystof Ponce and Jordan Richman, competed against 39 teams during the challenge. A total of five teams presented at the finals on Nov. 27 to a panel of judges, including representatives from IKEA Canada. The winning team will have the opportunity to work with IKEA on their proposal and discuss their sustainability idea with senior executives at IKEA Canada. They will also be flown to an IKEA-owned windmill farm in Alberta for a tour and to learn about IKEA sustainability initiatives. Each team member will also have an opportunity to interview for a co-op or internship position at IKEA Canada. Watch the winning team's video.